From left: ATAC Community Hall committee members Jacqui Bexfield, Brenda Fordy-Scott, Eileen Connolly and Maureen Welch, along with (right) Jeannie Kielty, development relations coordinator at The Banks Group, which contributed to the project. Users of a popular community centre are extremely relieved after work was completed on a major upgrade of its bathroom facilities. 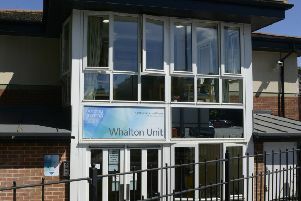 The collapse of the floor of the gents toilets at the Area Training & Activity Centre (ATAC) Community Hall in Widdrington Station had meant that everyone was having to share the ladies’ facilities, with a guard posted on the door to ensure everyone’s privacy. But a successful drive by the ATAC committee to bring in the £33,000 required to put things right has allowed for all the toilet facilities to receive a long-overdue upgrade, with a new separate disabled facility being created as part of the process. And feedback from visitors to the hall has already highlighted just how much of a positive difference the changes have made to the whole building. The Banks Group contributed £11,000 to the project, via its Banks Community Fund. Additional funding for the improvements was provided by Widdrington Station and Stobswood Parish Council; Northumberland County Council’s Community Fund; the Sir James Knott Trust; The Big Lottery Fund; UK Coal; and local councillors. It’s the second time that The Banks Group has made a major contribution to building work at ATAC, with a £9,000 grant provided in 2013 helping to pay for the repair of the hall’s leaking roof and other building improvements. Serving the villages of Widdrington Station and Stobswood, and surrounding areas, ATAC was established in the early 1990s. It is a base for a range of youth and adult activities, advice and training, and hosts a variety of events and organisations. Jacqui Bexfield, treasurer of ATAC’s management committee, said: “The changes we’ve been able to make have totally changed the feel of the building and they have lifted the whole environment of the place.